Did you know that B2B marketers spend 20-30% of their annual budget on event marketing and that event marketing is actually one of the top four spending areas — ahead of social media, customer intelligence, and email marketing? Event marketing offers a slew of options. From sponsoring large industry conferences and tradeshows to intimate seminars and company-hosted dinners. You might even host events as part of your event marketing plan. Event marketing is a tremendous way to target or find new prospects, establish and increase customer relationships, and engage with your prospects and customers face-to-face. However – spending 20-30% of your annual budget on event marketing is a huge investment and many organizations regularly struggle with maximizing their significant investment to fully attribute revenue generation and track ROI. Event marketing is more than just a launching pad to announce products and services, grow brand awareness or grow your sales pipeline. Implementing your event plan with a few essentials in place every time, you will boost your results consistently. Watch the Vlog to get the five essential tips and let us know your thoughts in the comments below! If you want to maximize your event marketing spend, this is the Vlog for you! Today we’re going to provide our top tips to capitalize on Event marketing. I know it seems obvious, but you’d be surprised how many marketers start planning events without taking the time to figure out what outcomes they want to achieve. Event Marketing can only be successful if you have clearly defined goals that also align to your broader marketing strategy objectives. So, before you start thinking about event logistics, decide why you want to host or participate in an event in the first place. I’m sure most of you have heard the acronym SMART, as it relates to goals. SMART business goals organize thoughts and drive success. Here’s how we see them tying to Event Marketing. S = Specific and your goals should always pertain specifically to your brand. M = Measurable. How will you know if you have achieved your goal if there is no way to measure it? Event Technology is extremely helpful here – every touch point, provides buying signals. You should be leveraging Event Technology to follow up, track and measure value of the events you are hosting or participating in. A = Achievable – to quote James Cameron – “If you set your goals ridiculously high and it’s a failure, you will fail above everyone else’s success.” Be sure that the goals you set are achievable. R = Relevant – No goal is worthwhile if the end result doesn’t mean anything to your business. What event marketing outcomes do you want to achieve? Building brand is good, but obviously too broad. Get specific to the relevant objectives your event will drive via experiential marketing. T = Timely – Obviously pre and during event preparation are important. BUT, the impact event marketing has on your business is post event. Be sure to set goals in this area as well. Whether you are hosting your own event or sponsoring a tradeshow, prospects participate in the event for two main reasons: Content & Networking. No one signs up to hear a sales pitch or a topic they aren’t interested in. It’s imperative that you deeply analyze the agenda and determine how your company adds value to the community who are gathering together. I encourage you to sit down with sales pre-event to craft the message. This way, you can be sure your prospects and customers hear a consistent story from everyone at your organization, not just marketing. Be sure and create a content strategy for every stage of the event. Before the event — Promote your event or attendance at the event. Provide a compelling invite, agenda descriptions, a video invitation or highlight of event features, etc. are great resources to capture the attention of your prospects and customers. During the event — You should provide relevant content and messaging. Obviously, presentation materials for sessions you’ll be delivering and product collateral, FAQs to promote your product and services. But equally as important, offer complementary content that positions your company as a thought leader. Examples include: White papers, eBooks, etc that answer the direct problems participants at the event are currently challenged with. Post-event — is typically the black hole we get sucked into. We’re back in the office and focused on the day to day or next event. Don’t lose sight of the most important aspect of your content plan – post-event communication. The unbelievable reality is that 80% of trade show exhibitors don’t follow up with their ‘leads’. 90+% of marketers are using social media to promote awareness for their events. Take advantage of those platforms to engage the community, convey your message and show your excitement. Be sure to use event and industry hashtags, as well as like and repost. 46% of event planners use event apps – if you’re not signing on, evaluating participants and reaching out to people pre, during and post event via the app, you’re missing a simple opportunity to engage with your prospects. 85% of event planners use event registration software – if you’re hosting the event and using reg software, you’d better be leveraging it. It does so much more than just “get people registered.” This could be an entire Vlog topic on its own. Do some research and take advantage of all the touch points you can create to understand the audience, increase engagement and improve results from the data points it collects. If you’re sponsoring, ask the event producers about the tools and data available to you. The results will have a deep impact on ROI. MarTech Integration is the most complex, yet provides the greatest opportunities for us as marketers. Integrating event registration software with your MarTech stack provides unparalleled opportunity to further personalize your message and integrate analytics and dashboards toward the ultimate goal of tracking sales conversations and assigning marketing attribution to ALL the touchpoints along the client journey. After clearly defining your event marketing goals and executing your plan to achieve them, be sure to track your success. Evaluation and revision is key to continued business growth. To stay ahead of the competition and improve your business you must critique your own strategy. 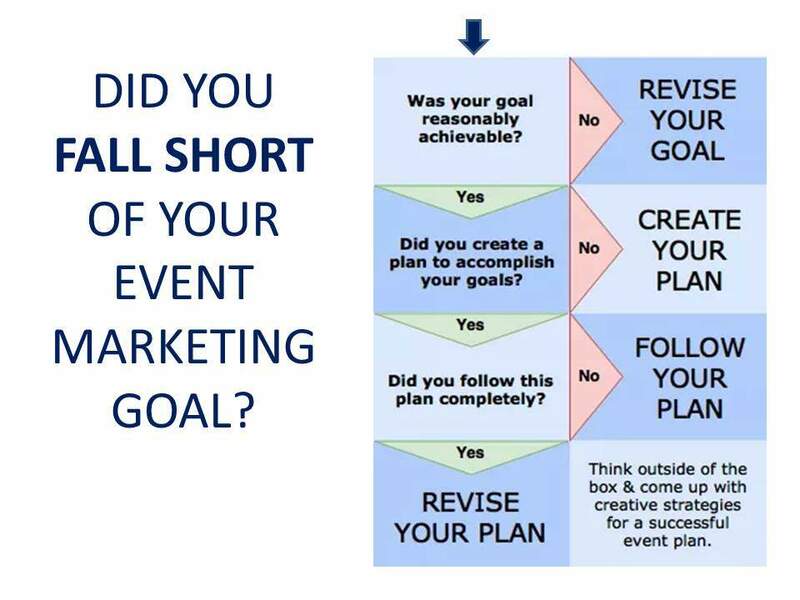 We encourage you to use this graphic as a guide to help access and reevaluate your event marketing goals. If you follow all 5 tips we’ve offered in today’s Vlog, we guarantee you’ll see serious improvements in your event marketing results. Let us know in the comments below your best tip for event marketing success! Until next time, grow your brand and drive demand! Very useful event marketing tips. These tricks will really help businesses to attain a successful event. If you have more, then I really want you to share them. Thanks Marcus. We appreciate the feedback. Feel free to share any tips that you find useful. How are you enjoying the Vlog?